Entertaining this summer has been fun and very little stress. 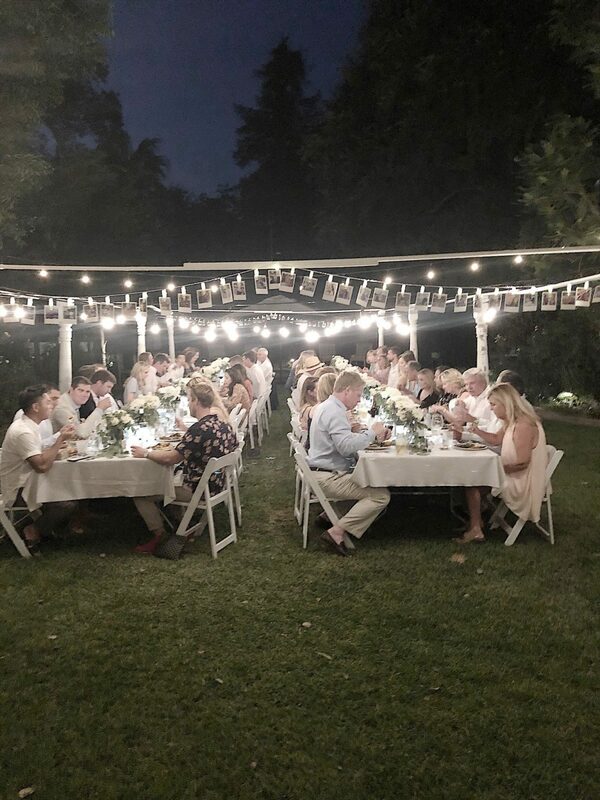 We hosted three different outdoor dinner parties and the experience has been incredible. Every day this week I am going to share exactly how I plan my parties and the resources I use to make them happen. And how I manage to stay calm throughout! 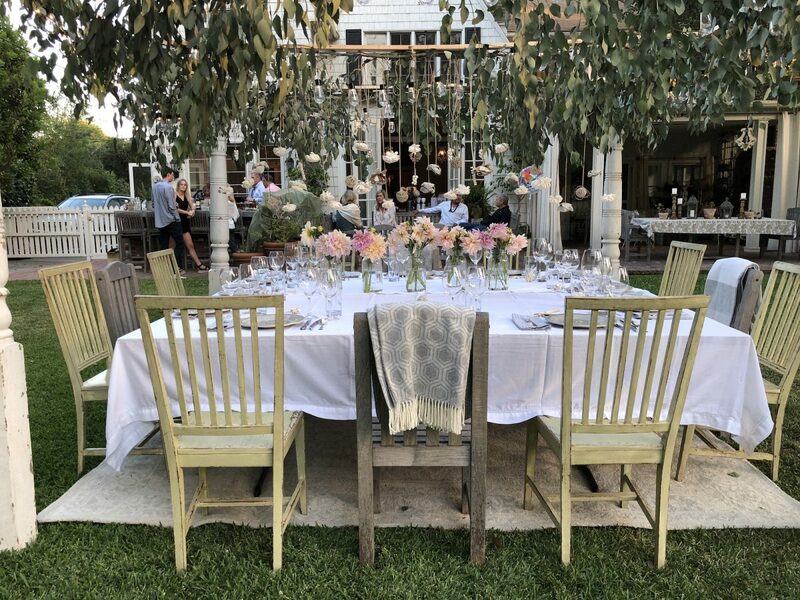 First, in a partnership with HomeGoods, I created an outdoor dining room for a dinner party we hosted for twelve close friends. 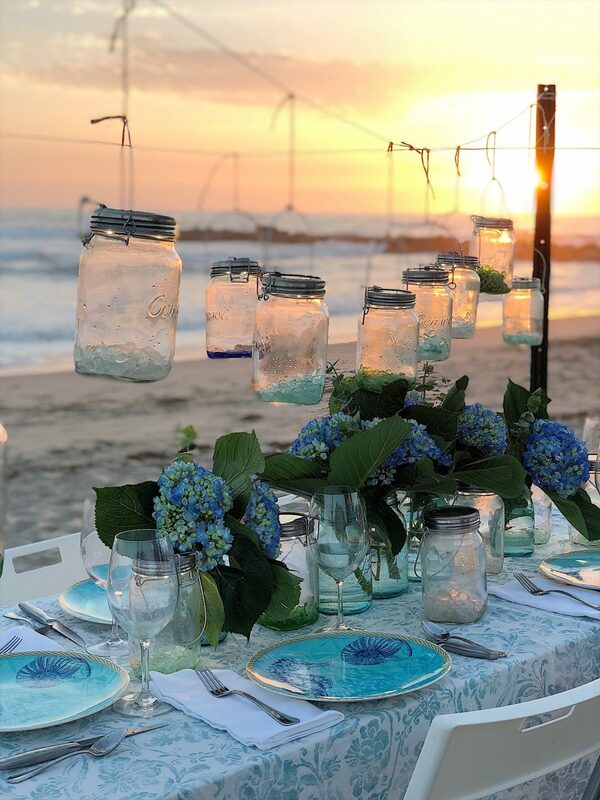 Next, I hosted a dinner party on the beach for our family and my son’s fiance. And then this past weekend we hosted an engagement party for our oldest son and his fiance. It was absolutely magical evening for 65 friends and family. I am so excited to share how the engagement party went from concept to reality. I hope some of my entertaining tips will assist you with your party planning. The first thing I do when planning a party is to define the vision of my party. I love this creative stage and it usually involves a lot of thought, creative thinking and looking on Pinterest. 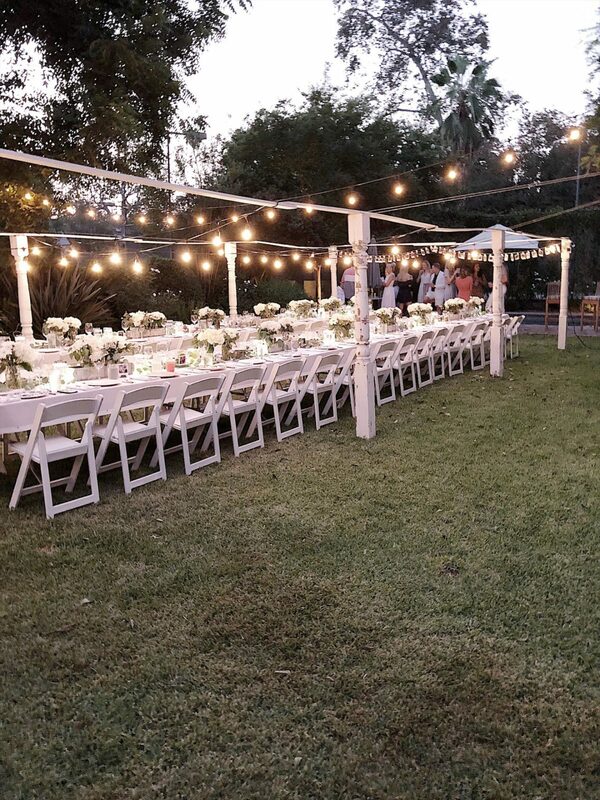 When we offered to host an engagement party for our oldest son Andrew and his fiance Charlotte, I knew I wanted to create some sort of outdoor party with a summer theme and fun lighting. 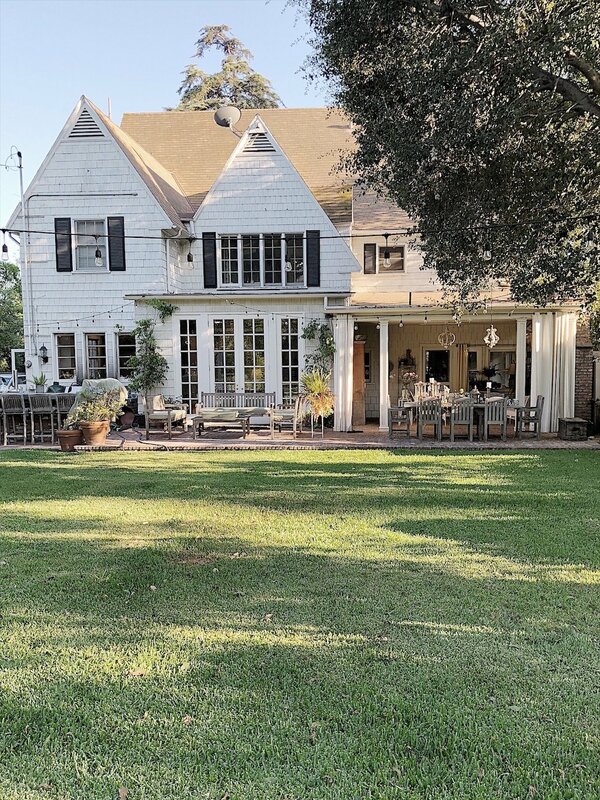 I wanted to use a lot of white and summer florals and oddly enough, the theme “California Hamptons” was a theme that my son Michael came up with. 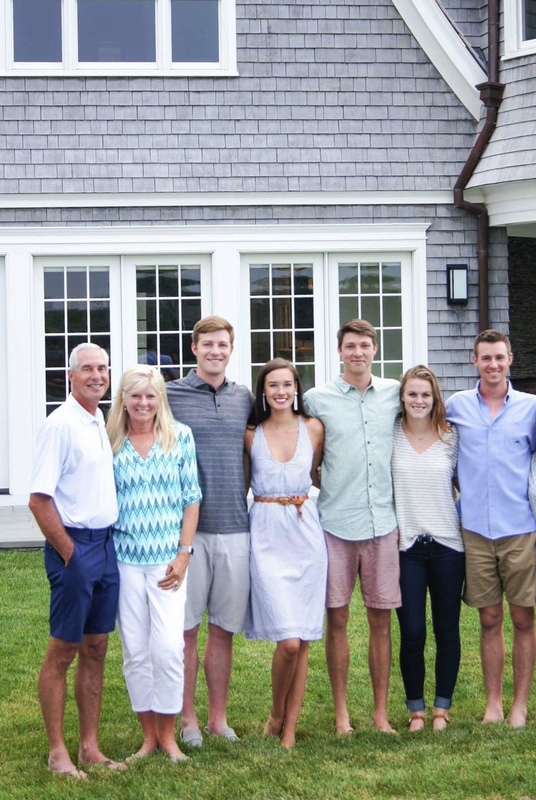 Two summers ago our family (and all of our son’s girlfriends) vacationed at a gorgeous home in the Hamptons thanks to my oldest brother and his family. It was the vacation of a lifetime and we loved everything about Bridgeport. So the California Hamptons theme was a combination of our life here in California and our fabulous Hamptons vacation. Once the guests of honor approved my vision, the planning began. 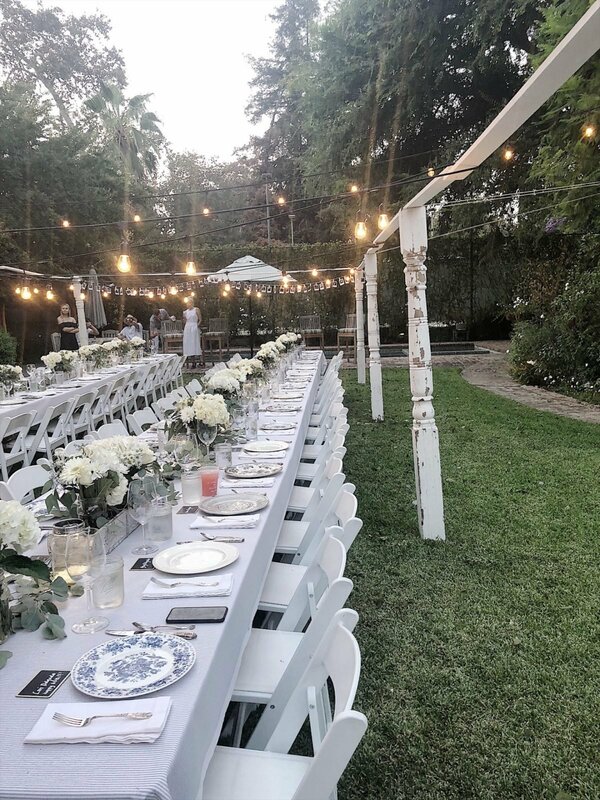 I had built an outdoor dining room for the party I did in collaboration with HomeGoods, and I wanted to do something similar. But I knew I needed to create a much larger room since the guest list had about 80 people on it. I came up with a color theme which was white, gray and medium blue. I am a big flea market shopper and wanted to use as many of my own things as possible. So I went through all of my linens, dishes, silver, glassware, vases and cloth napkins and discovered I had enough of everything, but the tablecloths, that fit in the color palette. 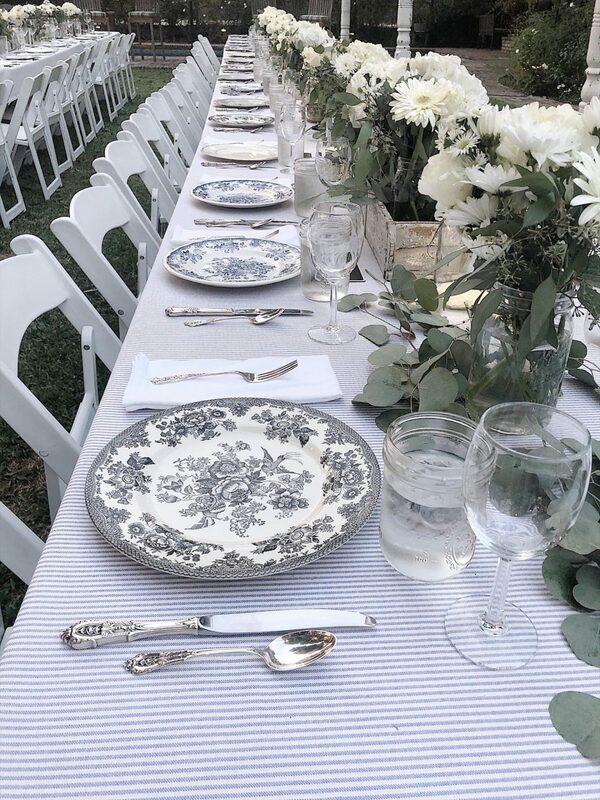 If you are wondering how I managed to have enough vintage china for a party this size, you might want to read my blog post about my “dish collecting”. Of course, the only way I could use all of my own items was if I mixed different patterns on the tables. I love creating tables like this so that was a no-brainer. Since I had never planned an engagement party before I went to Pinterest to look for ideas. This is where I started to panic. I found so many incredible ideas and photos with themes and creativity that I had no idea what to do. I wanted a lot of the creative ideas to be a surprise, so I reached out to my niece and my youngest son’s girlfriend and they helped me narrow down some of the ideas. The ideas I found on Pinterest were to have photos printed like polaroids, custom decorated cookies, and frosted drink cups. 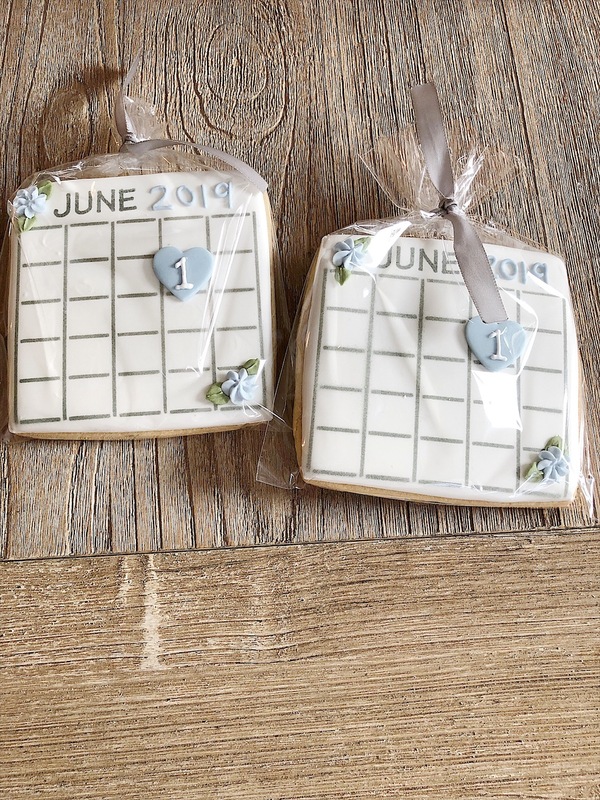 These cookies in the photo were the Save the Date gifts for the guests as they departed. I used a fabulous cookie baker and decorator at Designer Cookies to make these cookies. Aren’t they amazing? I also added my own ideas of custom chalkboards and pillows, special cocktails, chalkboard place cards, flower frogs and mason jar vases. At that point, the planning was almost finalized. I knew I was going to be out of town a few weeks before the party so I created a huge to-do list for the party. I get asked all the time how I can seem so relaxed when I am planning a big event and I think what helps me the most is to write everything down. If I don’t have a good list then I am totally stressed. But once everything is written down and I don’t have to worry about forgetting anything, then I am totally relaxed. 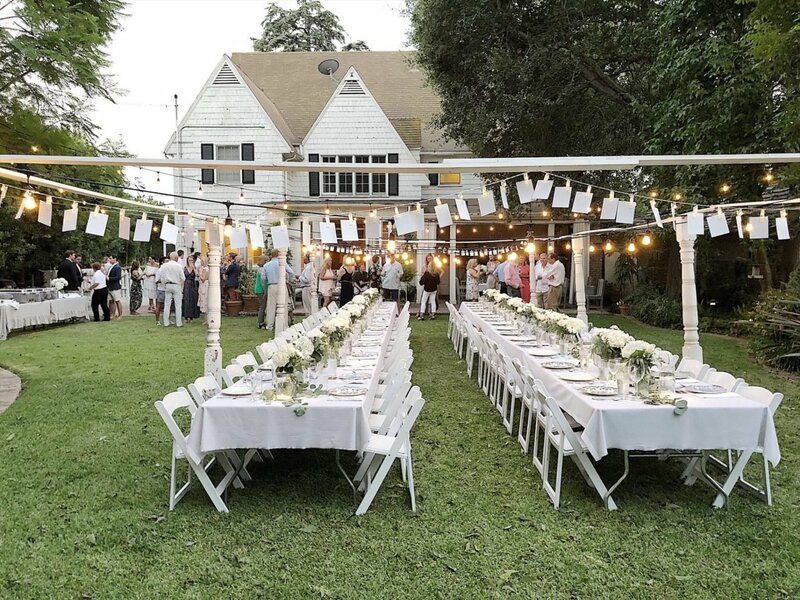 I listed out all of the elements of the party such as food, set up, invitations, guest list, shopping list, florals, and theming and then created a two-week schedule that identified every task and which day it had to be done. I had nothing listed to do on the day of the party because I knew I would have a few things to do that might carry over from previous days. Once again, I was right. I love printed invitations and sadly, we didn’t have enough time to print and mail invitations. In today’s day and age, email addresses are a lot more accessible than mailing addresses. So I used Paperless Post to send out the invitations. I used an adorable photo and loved how the invitation looked. Plus, the list management and email capabilities were fabulous. (I might actually prefer to use this method for our parties from here on.) There are a lot of online invitation services you can use and I highly recommend them! On tomorrow’s blog post, I will share how I built the “outdoor living room” for the party. Wednesday’s and Thursday’s posts will focus on the decor and Friday will be all about the menu and food planning. I can’t wait to share how my dream for a party became a reality! How exciting and how exciting that we get all the deets. I hope we get the food deets too. Love how you came up with the theme. I use email invites except for wedding events. The invitations become part of the photo albums and introduce each occasion. But maybe I’m more classic than most though. Beautiful! You are truly amazing and have a great eye for detail. I would love to see a more detailed list as I was asked to help my niece with her wedding. I’m new to your website and so excited to view your previous post and looking forward to future post! Can’t wait to read the rest of your posts! Amazing! Love the cookies! Can’t wait for all the details coming…. WOW Leslie! What a huge dinner party! I have hosted many parties but never had so much seating for everyone…truly impressive! !